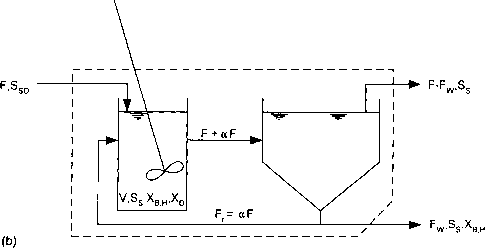 The term rotating biological contactor (RBC) refers to a class of aerobic attached growth bioreactors containing circular shaped corrugated plastic media that are mounted on a horizontal shaft, partially submerged (typically 40%) in the wastewater, and rotated at a speed of one to two revolutions per minute to alternately expose them to the wastewater and to the atmosphere. Figure 20.1 provides a schematic diagram. A number of manufacturers produce RBC equipment, but they are all similar and produce similar results. Microorganisms grow on the media and metabolize biodegradable organic material and nitrogen-containing compounds in the wastewater. Just as with a trickling filter, the produced biomass will slough off of the media and be transported by the wastewater to a clarifier where it is separated from the treated effluent. When the loading rate of biodegradable organic matter is sufficiently low, nitrifying bacteria will grow on the media and convert ammonia-N to nitrate-N. Wastewater that has been partially treated in another biochemical operation can be applied to an RBC system, where it will be nitrified.